Our finish will not peel, crack or yellow for two years. The warranty does not cover scratches to the finish from furniture, animals, smudges, smears, or dulling from use, abuse, any chemical cleaning, and damage made by animal products and by-products. If your finish should peel, crack, chip or yellow within two years of refinishing, Dr. DecknFence will refinish the area affected at no cost to you. 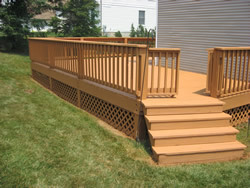 Dr. DecknFence will not cover the cost of alternative means of refinishing the affected area. 877-944-9663 ext 207 for Customer Service. The independent franchisee is responsible for the warranty. Are you organized, have some business experience or power washing experience? We are looking for owners who are not afraid to roll their sleeves up and jump into the mix. If this is you, then please take a moment and REQUEST FRANCHISE INFORMATION TODAY! We will contact you via email within 24 hours with additional information. Thanks for consideringDr. DecknFence!